I find that I regularly use some form of ChapStick type product — mostly just as a moisturizer for my lips year-round, but also to heal dry, chapped lips in the winter. I recently discovered Neosporin LT after seeing their commercial on TV. Their tagline was something along the lines of: "You know how good Neosporin is for treating cuts and scrapes… Imagine what it could do for your lips." I swear by Neosporin ointment for healing cuts in record time, so I’ve been meaning to pick up a tube of this stuff for my lips for weeks now. 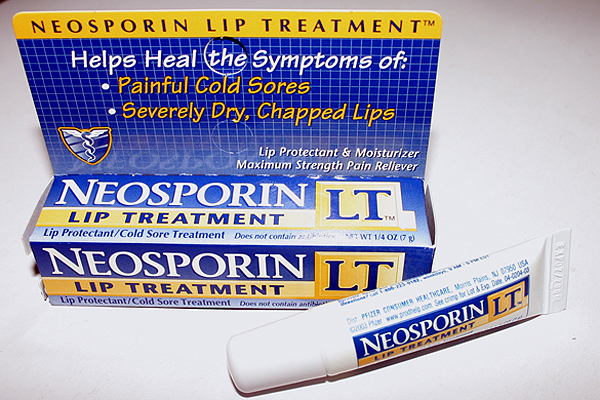 Finally, I am the proud owner of what I believe to be the best lip treatment product out there: Neosporin LT. I must admit… when I first thought of buying a Neosporin product for my lips, I kept envisioning that I’d be putting a mediciny-type product that was meant for other body parts — being fully aware that such products should never be used on your face. In fact, I imagined it similar to reaching for a tube of Preparation H and putting that on my lips. Neither seemed like a good idea. But then again, since I knew of Neosporin’s effectiveness in healing the skin, I figured it was a given that they could devise a lip-friendly product for treating the skin "above the shoulders" too. Up til now, Carmex was my lip-therapy of choice. I liked how I could "feel" the mediciny part of it working. That’s what a menthol-based product with do for you. While the Neosporin LT is less obvious in its working power, it resembles a healthy herb or extract that provides healing treatment for your lips. It’s very subtle, yet very effective. I think it’s the analgesic that you "feel" working. And it’s probably the Allantoin that makes your lips feel healthy and moisturized at the same time. When treating chapped lips, 92% of people apply lip care products twice a day or more.